Peanut Butter Candy Corn Crunchies - peanut butter cookies with candy corn and corn flakes - dip in white chocolate and sprinkles to make extra festive! It's almost Halloween! Halloween is one of my favorite holidays. I love all the pumpkins, ghosts, goblins and treats - especially the treats! 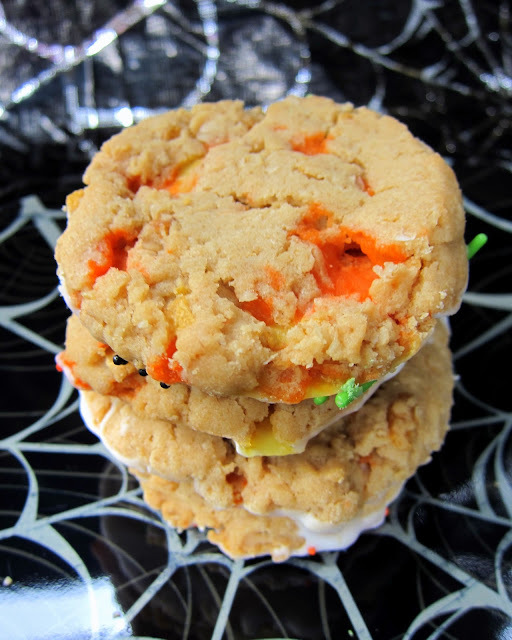 These cookies are one of our favorite Halloween treats. It combines some of our favorite flavors - peanut butter and candy corn. Don't skip the almond bark on the bottom; it makes the cookie. 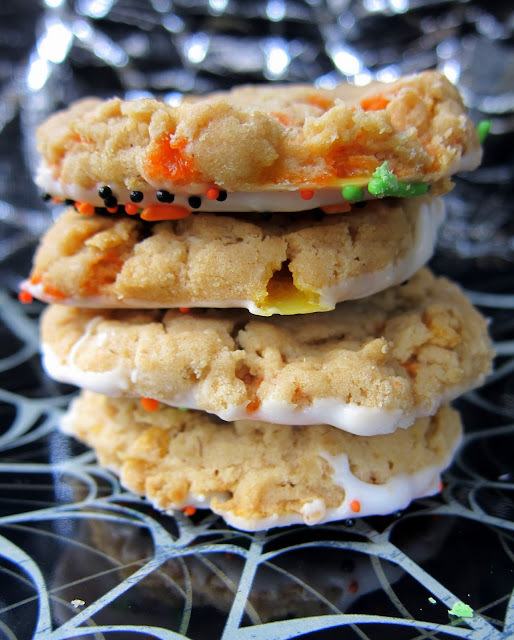 These cookies are a great way to use up any leftover candy corn - if there is such a thing! Baker's Note - I baked these cookies on parchment lined cookie sheets. This is an important step. The candy corn will melt and will stick to your baking pan if you don't use parchment paper. I had several cookies that the candy corn oozed out of the sides. Just let it cool a bit and break the melted candy corn off and you will have pretty cookies. Beat 1 cup of shortening and peanut butter at medium speed with an electric mixer until creamy; gradually add sugars, beating well. Add eggs and vanilla; beat well. Add flour mixture, mixing just until blended. Stir in oats, cornflakes and candy corn. Drop dough by heaping tablespoonfuls, 2" apart, onto lightly greased baking sheets; flatten slightly. Bake at 325° for 12 to 14 minutes. Cool slightly on baking sheets. Transfer cookies to wire racks to cool completely. Those sprinkles really make them sooooo cute! Oh my gosh, these look so soft and moist. May I have one now please? Those look so fun and yummy! These look great. Perfect for Halloween. These looked so good when I saw the recipe. When I made them today, the batter was so dry I had a hard time getting it to stick together to put on the cookie sheet. I checked and followed the recipe. Is this how they are supposed to be? I finally made them into bar cookies. they tasted good. I use Jif or Skippy - so the natural peanut butter could be the difference.